Here in America, today is one of the nation’s favorite holidays, at least judging from the $7.4 billion spent on Halloween products this year (source: today’s Fortune magazine blog). I know other countries don’t celebrate nearly as much, and in America especially, it has morphed from a meld of Christian and Pagan harvest feasts honoring the faithfully departed, to one of pop culture costumes and way, way too much candy. But many cultures still have a long and storied history of remembering the dead this time of year, from the Gaelic Samhain (SAH-win), to native Mesoamerican Dia de los Muertos, mixed with influences of Christian All Hallows Eve and All Saints Day. A lot of these Veneration of the Dead celebrations are a mixture of both fear and honor for the deceased. Some rituals were made to look after the well-being of their ancestors in the next world, some to make special sacrifices to stay on the spirits’ good side, or to ask special favors of the dead, especially from martyrs or saints in the church catacombs where relics of their earthly bodies were kept. Either way, the cultural familiarity with death was heightened in ages past, to a point, which, in my opinion, has been lost in the last century or so, as medical progress began raising the average life expectancy, curing disease which once killed large numbers of the population, and finally, with the creation of the funeral industry as a proprietary enterprise. That last factor I think carries a large amount of fault for what I call society’s death denial. 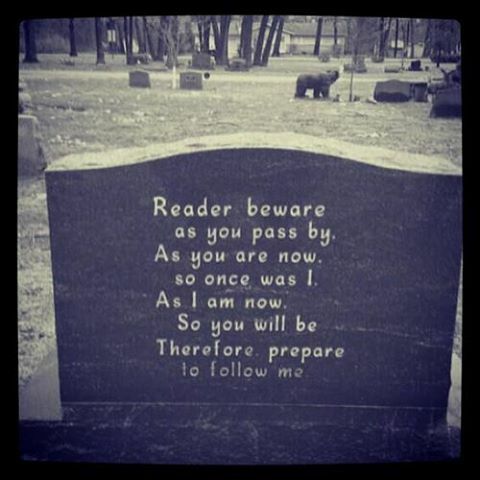 Nowadays, we keep death hidden. Hospitals have found discreet ways to transport dead bodies down to the basement morgue without upsetting the public. An unmarked van will pull up to a loading dock in the back and carry the corpse away to be prepped for burial or cremation. There is very little family involvement with the corpse, even when a person dies at home or in hospice, the body is just taken away and disposed of. Many people in the Western world go their whole lives without seeing a dead body, which is just so unusual when compared to the thousands of years of human history predating the death industry. I think this has lead to a real anxiety and phobia about death. Most times when we talk about death in our society, it’s in the context of tragedy. Where am I going with this? What does it have to do with pseudoscience? In yesterday’s post, I wrote about cognitive dissonance, that an idea– a fact– can be so uncomfortable to a person’s psyche, that they will go to great and illogical lengths to avoid it. There is no more sure fact that we all will die one day. Life is terminal. People with chronic and fatal illnesses know this better than “healthy” people, but that doesn’t make us immune to the fear of the unknown. I theorize that the natural movement and health craze that’s caught hold in recent years may be due, at least in part, to the societal fear of sickness and death. I haven’t personally seen any research done on this, so this post is entirely from my own curious ponderings, but it seems to me, that fad diets, the popularity of celebrity doctors and “wellness experts”, the insistence that “chemicals” are bad (chemicals in quotes because all matter is chemicals), and there are shadowy entities out to kill us all all have one thing in common: paranoia and fear. Orthorexia, which is yet to be clinically recognized, is a very real anxiety and eating disorder, in which the afflicted spends an unhealthy amount of time obsessing over their nutrition, and what’s in it. Constantly in fear that they’ve accidentally ingested an ingredient that they believe will give them cancer, detoxifying, or shaming themselves for not following a strictly organic/ vegan/ local/ paleo/ gluten- free/ GMO- free/ preservative-free/ antioxidant rich/ raw whole food diet, or whatever unusual rules they have dictated to themselves and others in order to match their perception of healthy. People, in general, are scared of their own mortality. Those who get caught up in the health craze are really just terrified of the most unavoidable part of life. A lot of us, especially who face death more closely than we should for our age, will often time seek out ways to control and prevent it. In desperation, our critical thinking skills can diminish, and we are more prone to fall for what may appear to others as obvious scams. With a lot to lose if we’re wrong, we become unpersuadable in believing that if we just put in the extra effort, we can somehow escape it. When sickness happens anyway, the blame gets shifted into ‘the patient just didn’t want badly enough to be healthy, or didn’t follow the program well enough.’ Conspiracies involving rich businessmen who will stop at nothing to keep us sick make space in our brains in order to square the round peg that is the fact that the inevitable happened, despite the patient’s best effort. It’s too hard to accept that this is just how it is, and sometimes, there’s nothing more that can help. The dissonance is too strong. When Brittany Maynard, the 29 year old who is opting for a planned death after a stage 4 brain tumor all but guaranteed her a painful, humiliating deterioration that would rob her of her entire self before eventually finishing off her body, made headlines around the world, quacks all over America came out to try to reach her in order to sell her their particular brand of cure. I believe most of these were motivated by selfish reasons: exposure, attention, drum up business, create controversy, etc. However, it started a national dialog about death and how it should be viewed. This attitude that insists that death is the worst possible thing that could happen to a person, is problematic in perpetuating a fear-driven market for pseudo alternatives. I believe if we had a more open conversation about death and sickness, more visible, tangible corpses, and rituals to make death more about a beautiful human send off (could be religious or not) that could be done by the family of the deceased at home, and without being immediately surrendered to the mortuary, our collective fear of death could be diluted (it will never disappear, of course) to a point that all places allow for a planned death, and these charlatans that use fear as their main selling point would lose a lot of power preying on fear and desperation the way they do now. I recently finished a book called Smoke Gets In Your Eyes, by Caitlin Doughty, a mortician and crematory operator who founded an organization called the Order of the Good Death. There she advocates for a more talked about presence of death in society, and educate people on their options for handling their death, getting over death anxiety, and really sort of shift the paradigm that exists of death being something to be feared into something that is beautiful and natural, and non-threatening. I highly recommend reading it, I finished it in just a few hours as it was a very easy and fun read. If nothing else, watch some of her Ask A Mortician videos on Youtube. For me, familiarizing myself with the natural processes of death has been therapeutic in accepting its eventuality. Now, this is not to say I am going to just give up and let nature take its course. Nor do I recommend that for anybody, modern medicine is a beautiful thing. However, when you find your thoughts straying into a place where dying is creating a cognitive dissonance and you begin accepting irrational forms of health advice, pause for a moment and recognize how your emotions may be determining your beliefs more than credible evidence, then call yourself out on it. Death doesn’t have to be ghoulish and foreign. Whatever your religious beliefs, or lack thereof, this Halloween, take some time out and think about how to remember the dead and honor their memories. Recognize your place in the land of the living only lasts so long, and that’s ok.